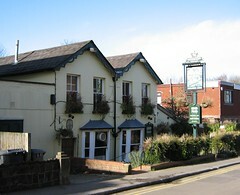 Greene King pub in New Barnet. According to the 2009 Good Beer Guide, it has a pool table in the back (public) bar, and a beer garden where barbecues occur in the summer. An anonymous visitor tells us that food is served lunchtimes and evenings, and they have live music at weekends, and guest ales as well as Greene King ones. We haven't personally verified any of this. Last visited by bob, 18 September 2010. Opening times and food info supplied by an anonymous visitor, August 2010. Last edited 2014-09-14 19:45:39 (version 15; diff). List all versions. Page last edited 2014-09-14 19:45:39 (version 15).